This week OPSEU was at Kingston’s Hotel Dieu hospital shooting a video about support workers. These workers provide a variety of essential roles within a hospital, but are seldom talked about. It is almost cliché for the public to call for more front line health care professionals without thinking about the skilled support that is absolutely necessary for them to do their work. Kingston Hotel Dieu is no longer a general hospital. The Health Restructuing Commission of the late 1990s had recommended that it close. Instead Hotel Dieu redefined itself. Today it does day surgeries, offers a number of clinics, provides diagnostic imaging, and hosts an urgent care center — but no emergency department. The lack of respect for hospital support has meant these workers too often have been the first to face layoffs in tough economic times, often with deadly consequences. One has to question whether layoffs of cleaning staff has been a contributing factor in the spread of hospital-borne infections. This has been a deadly spring for C-Difficile, particularly in the Niagara region. One member at Hotel Dieu told us she was on her third job at the hospital having been forced to use her seniority to bump into other positions. On the other hand, a member working in medical records made a point about the fact that his longevity at the hospital was connected to the investment in training they made in him. The support workers we met at Hotel Dieu are varied, from porters, groundskeepers and cleaners to ward clerks, printers, receivers, switchboard attendants and registered practical nurses. At times it was difficult to find a window of a few minutes to talk to them on camera. When we asked them about their jobs, they all felt they played an important part in the delivery of health care at the hospital. Without the proper paperwork or supplies surgeries would have to be cancelled. Without accurate information in the medical record, patients could be put at risk. Without porters to move people and material about the hospital, the facility would ground to a halt. Without cleaners the risk of hospital-borne infections would grow. These workers are not optional. 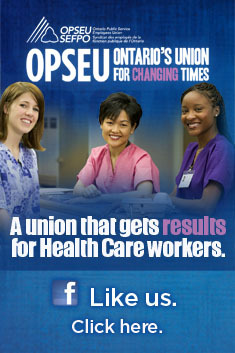 To see a sneak preview of OPSEU’s Hospital Support video, click on the window below. We hope to post the full video within the month. This entry was posted in Health System and tagged Hospital Support Workers, Kingston Hotel Dieu Hospital. Bookmark the permalink.